There is a true favourite and a false favourite in the early markets on the identity of the captains of the Europe and United States of America teams for the 2014 Ryder Cup. 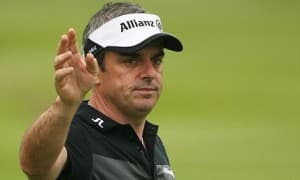 Bookmakers have installed Paul McGinley as the favourite to succeed 2012 Ryder Cup winning skipper Jose Maria Olazabal, who has ruled out returning for the Gleneagles event, which will be the 40th edition of the team golf competition. According to most pundits, there are seven contenders for the job of leading Europe in the 2014 Ryder Cup, with the legitimate field comprising Thomas Bjorn, Darren Clarke, Miguel Angel Jimenez, Paul Lawrie, Sandy Lyle, Colin Montgomerie and McGinley now that Olazabal is out. Bjorn and Jimenez are pushing the proverbial uphill because of their respective nationalities. It is hard to see someone from outside the British Isles being picked to be the face of the home side for a Ryder Cup in Scotland. And Bjorn is handicapped even more severely because, currently, he is associated with the committee that will make the call. Lyle really, really, really wants to be a Ryder Cup skipper but he has backed Montgomerie’s case for 2014 because the realist in him knows that he does not have the support of the key decision makers and his time has come and gone. So what about Montgomerie’s chance? Well, he is not backward in coming forward and he is telling everyone who is willing to listen that it would be an honour for him to get the job again and that, ideally, a Scot should be the captain for the Gleneagles competition. However, there has not been a multiple Europe skipper since Bernard Gallacher led his continent for the last time in 1995 and there are many excellent candidates who have yet to do it once. Lawrie is a Scot but he played for Europe in the 2012 Ryder Cup and he will have a fair shot at qualifying for the 2014 competition as a player. Also, he is not very high profile. So that leaves Clarke and McGinley, two of Olazabal’s four vice-captains for the 2012 Ryder Cup. Clarke is a popular bloke whose time will surely come. But he is being talked about as a natural 2016 Ryder Cup skipper because of his standing with American fans. So that leaves McGinley. Several bookmakers are quoting McGinley at 11-10 to be the man who leads Europe into Ryder Cup battle two years from now and those odds are somewhat generous. No less a figure than world number one Rory McIlroy believes that McGinley should get the job and the Irishman would be a popular choice with Americans who admire his sportsmanship. McGinley made headlines when he offered a handshake to JJ Henry as the American golfer lined up a long putt during their 2006 Ryder Cup match. Those who saw it will never forget it. McGinley made a lot of friends that day. And McGinley has served his captaincy apprentice having led Great Britain and Ireland to victory in the last two Seve Trophy events. He should be odds on for the 2014 Ryder Cup gig given the various issues facing his half a dozen rivals. Whereas McGinley deserves to be the favourite for the top 2014 Ryder Cup non-playing position with the Europe team, Fred Couples is well under the odds at 6-4 to captain the United States of America on the Scottish links course. Couples heads the market because he has skippered the United States of America to success in the last two Presidents Cup events and he will captain his country in its 2013 match against the International side. But there is a world of difference between the Presidents Cup and the Ryder Cup, most notably the American governing bodies behind them. The PGA Tour administers the Presidents Cup and the PGA of America administers the Ryder Cup. Guess which body rates Couples higher? Yes, the one that runs the Presidents Cup. Couples is a false favourite and the American to support at the current odds is David Toms, who is available at around 11-2 and fits the profile of a Ryder Cup skipper of the men in red. He is in his 40s, he plays on the PGA Tour, he has Ryder Cup experience and he has won a major championship. That Toms took out the 2001 PGA Championship will go down well with the PGA of America and he is the type of character who would be ideally suited to operating as an away captain. Back McGinley at 11-10 to skipper Europe and back Toms at 11-2 to captain the United States of America before the big prices about them being the 2014 Ryder Cup bosses disappear.